"Epic Glow" and "Oh Aches!" 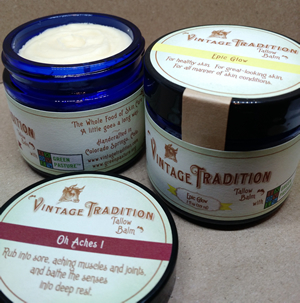 We are pleased to announce the creation and release of two new products, Tallow Balm with Green Pasture™ Oils. We have been collaborating with Green Pasture™ for some time to develop these all-animal-oil products, the only ones of their kind available anywhere! In addition to tallow, the principal ingredient, and in place of the olive oil found in our other Tallow Balms, we have added Blue Ice™ Fermented Cod Liver Oil, Blue Ice™ Fermented Skate Liver Oil, and X-Factor™ Gold Concentrated Butter Oil. As usual, the only other ingredient is the therapeutic-grade essential oils. Epic Glow is for skin and has essential oils of jade lemon, tangerine, marjoram, lavender, manuka, myrrh, and mastrante. Its aroma is mellow and lightly fragranced for a soft, comforting aura. The essential oils not only make the balm smell great and effectively neutralize the scent of the highly therapeutic tallow and fish oils, but they also stimulate the collagen to make the skin glow as well as aid the pores to relax. Our body knows best how to care for our skin, and it produces its own skin care product called sebum. Because of the tallow and Green Pasture oils in our balm, it has the same saturated fats (triglycerides) and squalene that make up the majority of our own sebum. There is no other skin care product that so closely resembles human sebum and can give you the healthy, great-looking skin you're looking for. All of these factors make Epic Glow Tallow Balm with Green Pasture™ Oils the best skin care product for whatever is ailing your skin, whether you are a woman or a man! Oh Aches! is for muscles and joints and has essential oils of wintergreen, peppermint, lime, black spruce, lemongrass, valerian, clove, and myrrh. Rub it into sore, aching muscles and joints, and bathe the senses into deep rest. It has a mild, cooling, menthol scent that isn't at all overpowering. The essential oils not only make the balm smell great and effectively neutralize the scent of the highly therapeutic tallow and fish oils, but they also have a long-standing tradition of helping muscles and joints. Before the petroleum and chemically fractionated plant products that we use now, people used animal oils, like tallow and fish oils, to soothe muscles and joints. We're bringing that back with this amazing balm! We replaced the olive oil that we use in our other products with Green Pasture's extremely therapeutic cod liver, skate liver, and butter oils. The skate liver oil, in particular, helps our balm to penetrate deeply and bring all of the benefits of the animal oils and essential oils to your muscles and joints. All of these factors make Oh Aches! Tallow Balm with Green Pasture™ Oils the best muscle and joint product available! 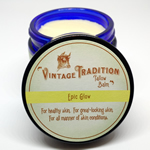 You may like to try the sample sizes of Epic Glow and Oh Aches! before springing for the regular size. Try yours now!